Polymer conjugation to therapeutic proteins through chemical and enzymatic methods. The aim is to improve the pharmacokinetic profile, and eventually reduce the immunogenicity, of these biotech drugs thanks to the increased size and reduced kidney clearance following polymer conjugation. Polymer shielding is also applied to liposome for the investigation of antibody-targeted delivery of anticancer drugs. Study and development of antibody-drug conjugates for the precisely delivery of anticancer drugs to cancer cells avoiding to hit healthy cells. Students will become familiar with diverse aspects of drug delivery and in turn they will practice with different type of proteins, such as, among others, cytokine, growth factors and antibodies, but also with anticancer drugs and oligonucleotides. In terms of analytical methods, the students will have the possibility to routinely approach several chromatographic techniques (either with HPLC or FPLC systems), dynamic light scattering, microcalorimetry, circular dichroism, fluorimetry, capillary electrophoresis, etc. A better understanding of the research projects available in the lab can be presented to interested students during face-to-face meeting with a lab visit. Nanomedicines are positively impacting several therapies and the potential improvements od such approaches are going from an improved efficacy, a reduced toxicity to an increased patient compliance. Personalized nanomedicines are expected to be the future of clinical practice but for reaching this ambitious target some aspects must be solved, first of all the development of feasible drug delivery systems that can be easily scaled-up. An intense collaboration with pharma industries can help to maintain the proper balance between innovation and feasibility of new approaches in drug delivery. The final aim of a drug delivery system is to increase the effectiveness of therapeutic protocols and at the same time reduce the toxicities and the overall costs of the treatments. Pasut G, Veronese FM, Schiavon O (2009). Polymeric conjugate of phospholipids. PD2009A000168. 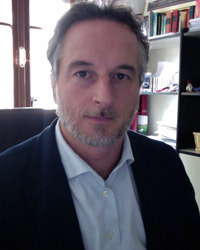 The research of Prof Pasut is supported by grants from public (AIRC Foundation, “Ricerca Finalizzata” Ministry of Health, PRAT and ex60% from University of Padova) and private (Pharmaceutical and Biotech companies) sectors.